A good piece. What ideally would be good to see is those on lower incomes somehow being subsidized. So those on reasonable incomes pay the full transit fare, but those on less are able to get Clipper cards where say (for example) double the value is put on their card. E.g. when they deposit $20 , $40 appears on their Clipper card. A concern here is that this seems open to abuse and this might turn into a money maker. But with the brains of Silicon Valley nearby perhaps we could do something. I used to work on a project in Uganda using biometric fingerprint scanners to verify identity. The technology is relatively inexpensive. Maybe there’s a fit here. Perhaps if you’re on a lower income and getting the Clipper bonus you’d have to scan your fingerprint when you travel with the card. This all depends on lower income neighborhoods having access to Clipper card machines and good transit networks. ^but those on less are able to get Clipper cards where say (for example) double the value is put on their card. E.g. when they deposit $20 , $40 appears on their Clipper card. Where would that $20 come from? Richard – as a fairly regular rider there is one extra hurdle you need to cross in order to get your schema working. Without fail, there is a direct correlation between income and Clipper Card usage – higher income riders have Clipper Cards, lower income riders shove handfuls of bills and coins into the machine. Which is a bad outcome, because GGT gives a discount to users with Clipper Cards. This makes sense on the surface because GGT saves/makes money with Clipper adoption – it speeds boarding which speeds service and makes the service more attractive, and it removes the need to handle cash fares which are subject to shrinkage and require service of some pretty balky fare collection machines. It’s a big discount, 15-20%. 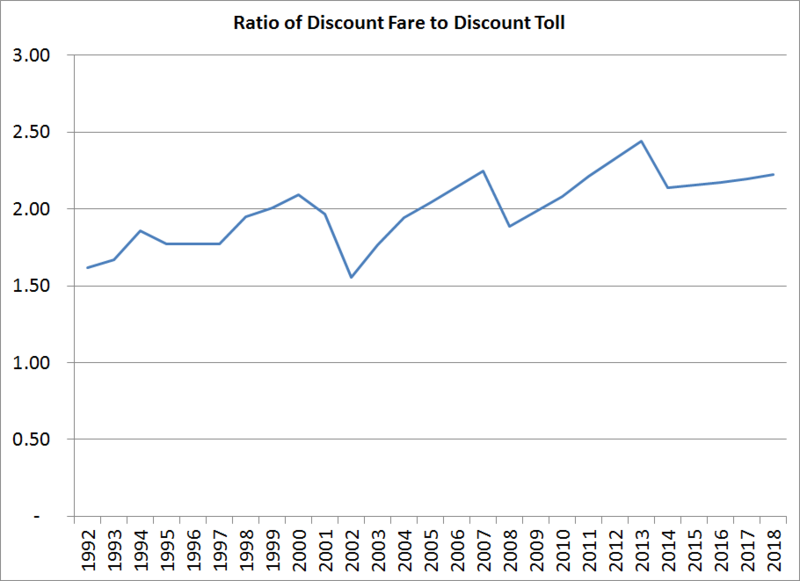 As a curiousity – why no call for lower income discounts for Bridge tolls? Right. There should be BART-style Clipper dispensers at the transit hubs: San Rafael TC, Piner, Santa Rosa TM, Marinwood, Hub, Seminary Drive, etc., with refill machines elsewhere (if they are, indeed, cheaper). Part of the problem with the much-better SmarTrip Card in DC is that people don’t have enough disposable income to load onto the card. Since people can load their cards on the buses, they just load it with a single trip’s worth of money and then swipe for the discount. A similar problem of too-little disposable income is likely at work in Marin, too, which pushes people to use cash rather than Clipper. The problem of giving the poor a leg up on transportation is one that plagues systems across the US, so we are in good company. I don’t pre-load anything onto my Clipper Card. It’s tied to my credit card, which is an instrument less prevalent amongst those with lower incomes. To add insult to insult, the credit card I have tied to my Clipper Card is a WageWorks card which is funded by pre-tax deductions from my paycheck. So I am getting a 20% Clipper discount and then the resultant amount is deducted from my taxes giving a 30-40% discount from there. All of this is somewhat moot in my opinion. I believe David is right to start with. Instead of adding costly programs to figure out how to means test transit riders for discounts, we have a very simple generalization that can be made. The median per capita income of someone driving over the bridge is higher than that of someone taking the bus. Give the lower income person a discount by making the bus cheaper than driving. The side effect of a higher income person choosing transit because of this discount has positive externalities and should not be mourned or discouraged. It’s overly presumptive to increase costs on car commuters and presume they are all on higher incomes. Secondly what seems to be implicated here is subsidizing all transit riders, when many are on higher incomes. I know plenty of high income ferry and bus riders. If we can focus on those on lower incomes the subsidy effect can be magnified. What we need to avoid is inadvertently significantly increasing the cost of living for all, in order to subsidize another group that happens to have a different travel preference, some of whom may be on lower incomes, or perhaps who doesn’t have kids to drop off…etc..
Richard – by your argument we should double the bridge toll and give a means tested discount. I’d be concerned about leaving behind the technical mission of alleviating congestion if we focus too much on the social justice aspect. The right fare/toll ratio for the non-poor might be 2.5, but the aim there should be congestion management balanced with income, not ensuring a certain ratio. The ratio’s steady increase is a symptom of deeper problems. Can you show a chart showing transit, tolls and inflation? Or transit, tolls and gas prices? I’m wondering if transit has been creeping up too fast, with GGBTD overly burdening transit fares due other costs being lumped on. What I’d like to see is both track inflation fairly smoothly. For congestion management on 101 metering lights seem blindingly obvious. I’d hate to see an HOV lane policy going to 3 people if this means that lanes aren’t all used as efficiently. ^the fare hikes render transit more and more into a second-class social welfare service rather than the first-class transportation service it could be. Um, aren’t you forgetting something? As in, the money extracted from drivers which is given to the bus riders? GG bus service IS a welfare service. A leech on the regional economy. If bus riders wanted to pay for it, there could be first class bus service, such as we see in those big white SF to South Bay buses. Buses which participate in the economy, as compared to taxing the economy. No one is preventing that from happening in the GG corridor. US-101 is a welfare service as well, my friend. Then let’s stop that too. If highway taxes aren’t covering the highways, that’s wrong. Less interesting are various sophistry showing bizarre unpaid costs of driving. The US economy is based on fast, efficient transportation, mostly private automobiles and semi-trucks. We have the best transportation system in the world. Road taxes of all kinds aren’t covering the cost of the roads. User fees account for just 34% of California road costs, a worse ratio than Golden Gate Ferry and far worse than BART or Caltrain. Then let’s fix that. Streets and roads should be 100% financed by user fees and taxes. However, the issue is commonly clouded by murky accounting, both on the income and the outgo sides of the ledger. For example, the federal Highway Trust Fund, financed by various taxes on drivers, spends somewhere around 15% of its revenue on mass transit, and a smaller but important percentage on cleaning up old gas station properties. How does a given study account for that? Usually, by implementing its own bias. The study cited mentions the Highway Trust Fund, but seems to indicate that money spent by that fund on mass transit is one of those things they didn’t care to account for. As if, somehow, mass transit costs are part of the highway system costs. That’s sophistry, and it clouds the analysis. The GG bridge is a micro example, generating huge excess income mostly used to pay for mass transit. How did the cited study, or some other random study, account for such things? More sophistry? So let’s get roads properly financed, but stop seeing drivers as cash cows to finance various social agenda. Social agenda should be supported broadly, not by drivers. To address the critique of the study: if we ignore that the Highway Trust Fund is partially funded from general tax revenue and add back in the 20% that goes to non-road projects (and ignore the positive externalities those other projects have for roads), then user fees and user taxes cover about 36% rather than 34% of road spending. But to address the core critique, that transit spending is wasteful spending for the GGB, I think it would do well to determine whether it is more cost effective accommodate 25% more driving traffic in the North Bay than to keep those potential drivers on transit. This would mean weighing the added cost to double-deck the Bridge, widen 101 to 10 lanes, widen the various approaches to 101 by 25%, and add 25% more parking in Sonoma, Marin, and San Francisco, as well as lifecycle and maintenance costs for each of those, against that of running a transit system to accomplish the same end. Can these costs be borne by the toll? I’m unsure, but I don’t think so. The point of this post’s analysis above isn’t to argue that drivers should be a cash cow. That’s still narrowly interpreting the toll as a revenue stream for projects, which is just as profoundly stupid as setting fares to meet fare revenue targets. Of GGBHTD’s three missions – keep traffic flowing, provide supplemental transportation for those without cars, meet operating expenses –the revenue received is only critical for last of those. However, if the toll is a tool to meet the first mission, then the revenue can be used to help meet the second. If our country’s economy relies upon free-flowing traffic, then it’s vital we use all the tools available to ensure we can keep it flowing freely, including road pricing and non-automotive transportation. That way, our transportation market to properly segment into the most economically efficient methods for the given trip. I consider transit subsidies to be countervailing subsidies meant to offset the much larger subsidies given to automotive transportation and its attendant built environment. It’s horribly wasteful, leading to political interference in transportation planning, which leads to even more waste. But we’re stuck with this broken system for now, and the proposal outlined above seems to be the best way to meet the needs of our regional economy short of a more radical rebalance of the sort I think we’d (roughly) agree upon. We’ll agree that the macro picture is not really much likely to change. We can grumble. If we separate social agendas from the business of running a bridge, we would end up with an ideal solution being something like “demand based revenue neutral tolls”. Tolls would be much higher at times of high demand, and much lower at times of low demand The results would both spread the load out as well as being a purely fair tax on value. The fair toll mechanism would also correctly define alternative transportation economics. If it cost $30 to cross the bridge at 8AM (and 50c at 3AM), a morning ferry service might be self sustaining, and bus service would similarly be attractive even at profitable fares. Then, if some need welfare, we can evaluate their needs independently of the bridge tolls, and help them out with funds extracted from the broad economy. dw – I’m all for that. The problem we have in hand is that if we quickly scrap current funding measures and triple the toll and quadruple the gas tax, people who have planned their lives around the current subsidization would be in deep crap. Suddenly you can’t afford to drive to your job that isn’t near transit, and your house is worth 25% less because it costs too much to drive anywhere from your dislocated house. Unfortunately it has to be a bit of a slow drip. Even if we correct pricing meant jacking up gas prices such that people would economically prefer the bus, we can’t triple bus capacity in a day. 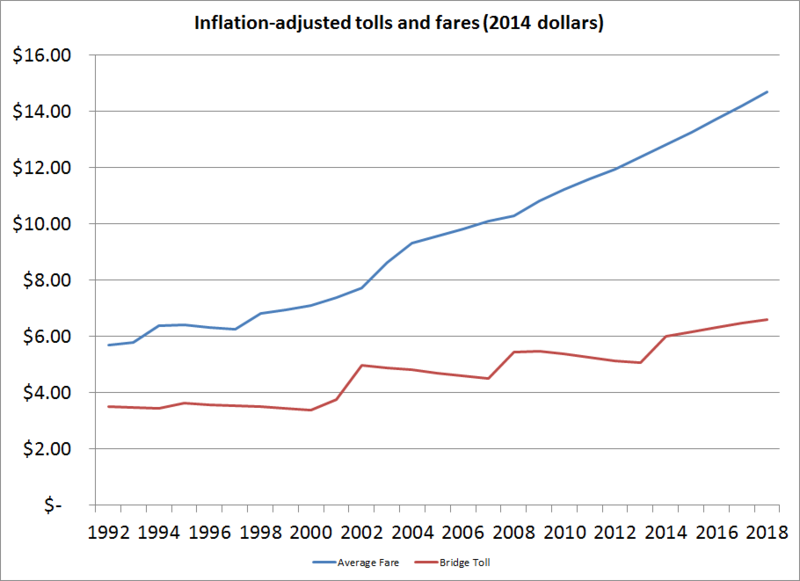 Increasing the tolls by a small amount to improve bus and ferry service is … a slow drip. The fundamental problem underlying this conversation is the cost of the GGT bus service. Bus operating costs have gone up about 250% in the last 20 years, while inflation is only up 58% over the same period. While it may be true that bus fares are rising faster than tolls, they are not rising nearly as fast as bus operating costs. Farebox recovery on the bus was nearly 40% about 20 years ago and it looks like 16% in the upcoming budget. GGT may have a standard of a 25% farebox recovery but they don’t seem be meeting it by my reading of their CAFR. Despite rising fares, it looks like to me like less and less of the share of bus service costs are being passed on to the rider. Rising costs are partly being picked up by drivers, but are also backfilled by taxpayers through other public revenue sources which helps to mask the cost of GGT’s operations. I understand the concern for riders, but fare increases would be less necessary if GGBHTD ran their bus service more efficiently. Their cost structure is much, much higher than many of their public sector bus operator peers. Dave’s argument is about who should pay for increasingly expensive bus service – riders, auto drivers or somebody else. That’s fine. However, we also need to pay closer attention to what’s driving the cost increases in the first place. Inflation typically excludes gas prices, which are up a lot more than 58% in the last 20 years. Fuel prices ARE included in the consumer price index. They represent about 5.5% of it. Meanwhile, fuel costs represent about 7% of GGT’s operating expenses. So….GGT spends about as much on fuel as your average American consumer as a share of thier total expenses. A big spike in fuel price would therefore have about the same impact on inflation as on GGT’s expenses. You can’t pin GGT’s fare increases and and dramatically rising costs over the last two decades on fuel prices. About 84% of thier costs are in labor.